It’s July and it’s hot. Blueberries are coming in, hitting their peak in the next few days. At first they’re fine by the handful, tossed over cereal or sprinkled in a fruit salad, but then we’re ready for pie. When the heat settles and a little breeze wafts, we can think of the chicken on the grill, the platter of roasting ears, and blueberry pie with home churned ice cream. Even if the kitchen’s too hot to turn on the oven, plug a toaster oven in on the patio, choose a smaller pie dish and have a summer berry pie anyway. 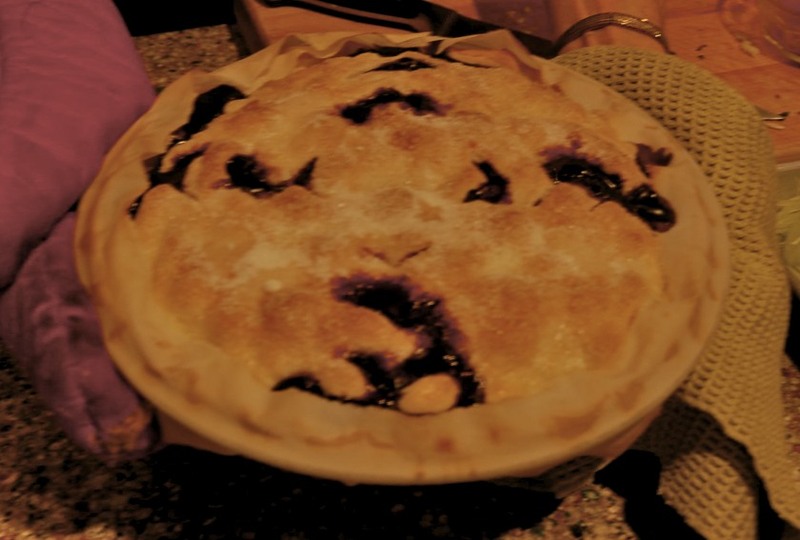 Maybe it’s meeting the challenge of trapping those purple juices between pastry that makes the pie a must have. Or perhaps it’s the memory of pies at the state fair or pies on grandma’s counter. Wherever we come from, summer fruit pie is a part of the culture that touches all of us. We could choose cherries, peaches, apricots or gooseberries, but today we’re all about blueberries. The world’s best blueberries are from our American fields; they’re ripe and ready for us right now. 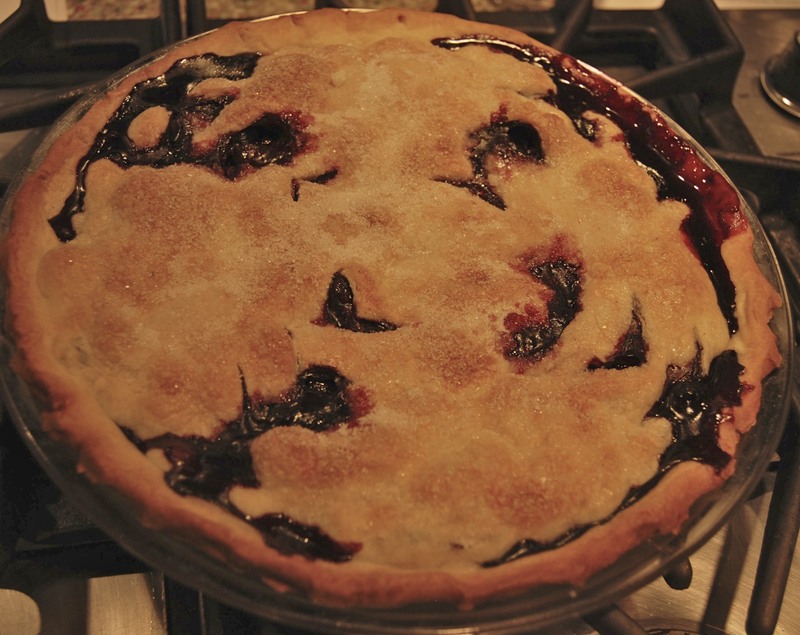 Blueberries, most flavorful when lightly cooked, stand out as summer’s consummate berry pie. The following recipe gives you a buttery crust and a full fruit, not too sweet, filling that’s just right with a scoop of vanilla ice cream. The little fruit pie trick I’m always eager to share is the strip of cloth used to bandage the pie’s edge. Rip a strip from a clean, old sheet. Dampen the cloth, wrap the pie’s edge and bake away fail-safe from spills, burns and mess. The damp cloth sticks to the pie dish and can be easily pulled away while the pie’s still warm. Photo shows pie with bandage. To make pastry by hand, sift flour, sugar and salt into a wide bowl or onto a clean flat surface. Slice over cold butter and “cut” into flour with dough scraper, pastry blender until size of peas. Rub your fingers through flour until butter is in smaller flakes. Dribble over ice water 2 tablespoons at a time, draw liquid through flour with fingers or fork and bring dough together into compact ball. Shape into log, wrap and chill. To make pastry in food processor, place flour, sugar and salt in work bowl. Slice in cold butter and pulse to coarse meal. Let machine run, and pour in water through feed tube. Stop machine as soon as dough comes to a ball. Shape into log wrap and chill. roll on lightly floured surface to generous 12-inch circle. Fold rolled dough in quarters and unfold in 10-inch glass pie plate (choose glass so you can see whether pastry is cooked on bottom). Press pastry neatly into bottom of plate and trim overhang. Add trimmings to remaining pastry dough. Sprinkle 2 teaspoons flour in bottom of shell and set aside while you prepare filling. Preheat oven to 375°F. In wide bowl mix sugar, tapioca, and salt. Add berries and lemon; fold gently to combine. Scrape sugared fruit into pastry shell, and dot 1 tablespoon butter over top. Roll remaining pastry to generous 12-inch circle, brush off flour, fold in quarters. Use sharp knife to make three ½-inch diagonal cuts in pastry along each fold, beginning 1 ½ inches from center point. (These cuts will give you 12 small steam vents). Using your fingertips dipped in water, dampen pastry edge on lip of pie dish. Dry your fingers and unfold top pastry over fruit. Seal edges by tapping with fingertips. Trim to ¼-inch overhang. Tuck overhang under lower pastry edge; crimp as desired. Moisten strip of sheeting in cool water and squeeze out. Bandage edge of pie with cloth strip by pulling cloth around edge of pie dish half under lip and half over pastry. Overlap cloth to seal. (Cloth will protect edge from burning, will hold in bubbling juices and will save your oven floor!) Use pastry brush or fingertips to paint top crust with cream or milk and sprinkle generously with sugar. Bake in preheated oven for 20 minutes. Reduce heat to 350°F and continue to bake about 20-30 minutes longer or until top is golden and bottom crust is evenly browned. Remove to cooling rack; peel off cloth strip while pie is still warm. It was mid summer on a small island in the Cyclades. Evening fairy lights twinkled in the plane trees around a village square. 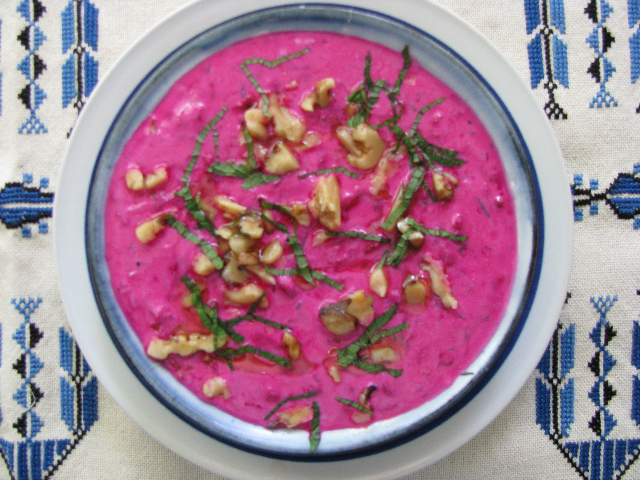 There, in an open air taverna, I first laid eyes on a bowl of beet tsatziki. Ravishingly purplish pink, I had to have it. Creamy, tangy, sweet, it turned out to be the taste highlight of a journey to the place of the “wine dark sea” where that “rosy fingered dawn” breaks through the night. It’s as ancient as yogurt, beetroot, garlic and walnuts that come together in this traditional salad perhaps Socrates or even Homer may have eaten. Today we return to these nourishing Mediterranean foods that have held on through centuries and sing of good health. Yogurt to stimulate beneficial flora, beets to cleanse and strengthen the blood and garlic to boost immunities. When I presented this dish to a group of vegetable-curious cooks, even those who shied away from beets were swayed with this amazing flavor combo. Here the humble beet lifts to Elysian heights as a perfect picnic side dish. Beet Tsatziki may be a dip for pita or vegetables, a sauce for grilled fish or chicken, part of a composed salad plate or a lunch in itself, nestled in a bowl of butter lettuce leaves with crusty toast on the side. Mash garlic with salt and mix with lemon juice or vinegar, let stand few minutes. Peel and grate beets on wide holes of a box grater (use small holes for raw beets); you should have a scant half cup. Combine beets with yogurt, macerated garlic; season with little chopped dill or mint and green onion. Taste for salt and acid. Garnish with olive oil drizzle, freshly ground pepper and chopped walnuts. Makes generous l ½ cups. My grandmother always had jelly on the dinner table. For special occasions she served it in a gold-trimmed, ruffled-edged porcelain dish with a flat-bowled silver jelly spoon. We had soft Parker House rolls to butter and embellish with quivering slices of black raspberry jelly. Summertime saw jelly bags hanging from cupboard doorknobs and dripping dark purple juice. Wide pots boiled that juice with sugar to a shimmering set. Ladled into squat jars, topped with melted paraffin and capped with brass-colored lids, the jelly awaited its summons from darkened basement shelves. Now fruit is scarcer, time is shorter and jam is my choice of preserve. It takes less sugar, less time and uses the entire fruit. The simple, quick process makes me wonder why anyone is content with saccharine-tasting commercial jams gooey with high fructose corn syrup and stiffened with pectin. A couple boxes of berries, several soft peaches or the golden plums from your farmers’ market will give you a jam to make the smallest breakfast seem like a memorable feast. 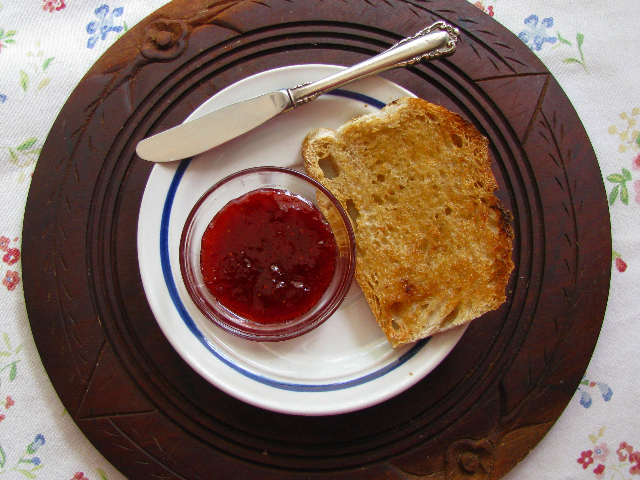 The basic procedure for strawberry jam will work for most fruits. Tarter fruits with higher natural pectin content, such as plums, apples, blackberries or raspberries, don’t need the lemon juice. Cap and slice the berries into a medium, heavy stainless steel or enameled iron pot. Mash with a potato masher, add lemon juice, cover and cook gently until the berries soften and pulp. Stir in the sugar and boil quickly, stirring often for about ten minutes. Meanwhile heat two or three clean jam jars and their twist-on or cap lids in a pan of simmering water. With a little experience you will know what the jam looks like when it is ready. Lift the stirring spoon from the mixture and let the contents fall gently back into the pot. When the jam slides off the spoon in a sheet rather than dripping off in separate drops, it is ready. You can also test it by spooning a few drops onto an ice-cold saucer to check thickness when pushed with a finger. Boil the jam a few minutes longer if necessary. If the jam foams as it boils, stir in a sliver of unsalted butter to disperse foam before jarring. Cool the jam a few minutes before ladling into hot jars leaving a half-inch for the vacuum seal. Wipe the top of the jar with a clean cloth or paper towel and twist on the hot lids or caps. This hot-pack seal should keep the jam for several weeks. For longer storage, it’s advisable to simmer the jam jars in a hot-water bath for 15 minutes. You are currently browsing the Mary Jo's Kitchen blog archives for July, 2011.